How accurate was your amazing prediction? What most surprised you about the data form the figure above? A number of major Democratic presidential candidates have already supported Medicare-for-all. Explain what it is about the party platform and liberal political ideology that would make these Democrats so supportive of Medicare-for-all. Given what you know about Republican political ideology and party platform, explain whether you expect any major Republican leaders like Mitch McConnell or Donald Trump to embrace Medicare-for-all. Wait a second, what is Medicare anyway? Did you know that, according to the American Association of Retired People (AARP), before Medicare become law in 1965, almost 1 in 2 older Americans had no health insurance and faced a bleak future if they got seriously ill. Their choices often included wiping out their savings, taking money from their children, seeking welfare or doing without care. Medicare delivers a guaranteed level of coverage to people who might not otherwise be able to afford it. But how exactly did Medicare get invented and become law? Explain whether you support the idea of people over 65 having federally provided health insurance. If all people over 65 have a right to have government provided health insurance why don’t people in their 30s or their 40s have the same right? Describe how life in America would be different without Medicare. 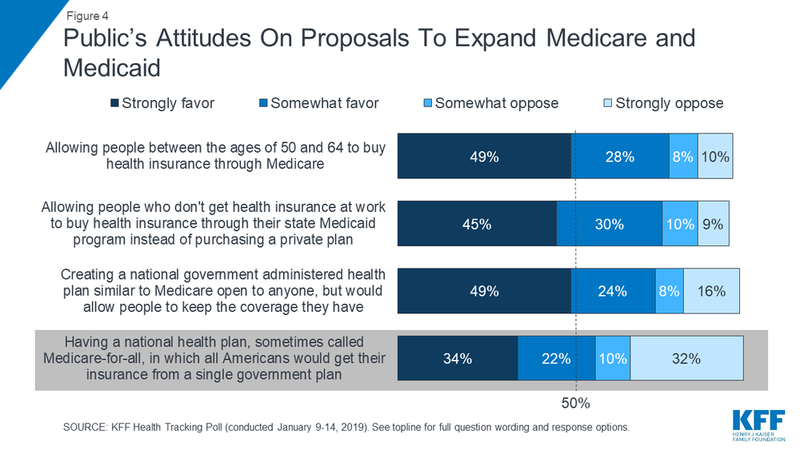 77% of Americans (all Americans: Republicans, Independents, and Democrats) agree that people between the age of 50 and 65 should be able to buy insurance through Medicare. What about the American political process has kept that very popular idea from becoming a reality? If you were a member of the U.S. House of Representatives and governed as a delegate, Given public opinion in support of it, explain what position you would most likely take on Medicare-for-all. Since there is nothing in the U.S. Constitution directly about creating our outlawing Medicare, Explain how Medicare is legal. Imagine that the U.S. decided to move towards Medicare-for all, describe the rolE each of the three branches of government would play in the law-making and implementation process. Imagine that Americans became serious about adopting Medicare-for-all. Describe the actions interest groups opposed to Medicare-for-all could take to limit its popularity and adoption. America already has the most expensive health care in the world, with an extremely low return on our investment (we don’t get a lot of bang for our health-care back). Do you think Medicare-for-all would improve our return on our health-care investment? If we had a Medicare-for-all system Describe a method the country could use to pay for it. What is the most interesting thing you learned in today’s class starter? What questions do you have about Medicare-for-all? How big of an issue do you think Medicare-for-all will be in the 2020 presidential election? What famous basketball player from North Carolina wore jersey #23? Check out the tracking polling data from this Kaiser Family Foundation public opinion poll about Medicare-for-all. Research which major presidential candidates support Medicare-for-all and share your findings in class or online. Ask your English teacher to predict who has a bigger vocabulary, William Shakespeare or Wu-Tang Clan. See what they say. Tell them that they are wrong. See what happens.